Glow & Discover Light Bar Activity Station is rated 4.5 out of 5 by 23. Great minds start little.™ Colors, animals, lights and melodies are right at baby's fingertips during tummy time or sitting play! Make tummy time fun and engaging with the enriching content of Baby Einstein’s Glow & Discover Light Bar™. Toy bar lights up when baby touches the colorful sections or spins the rattle drum. 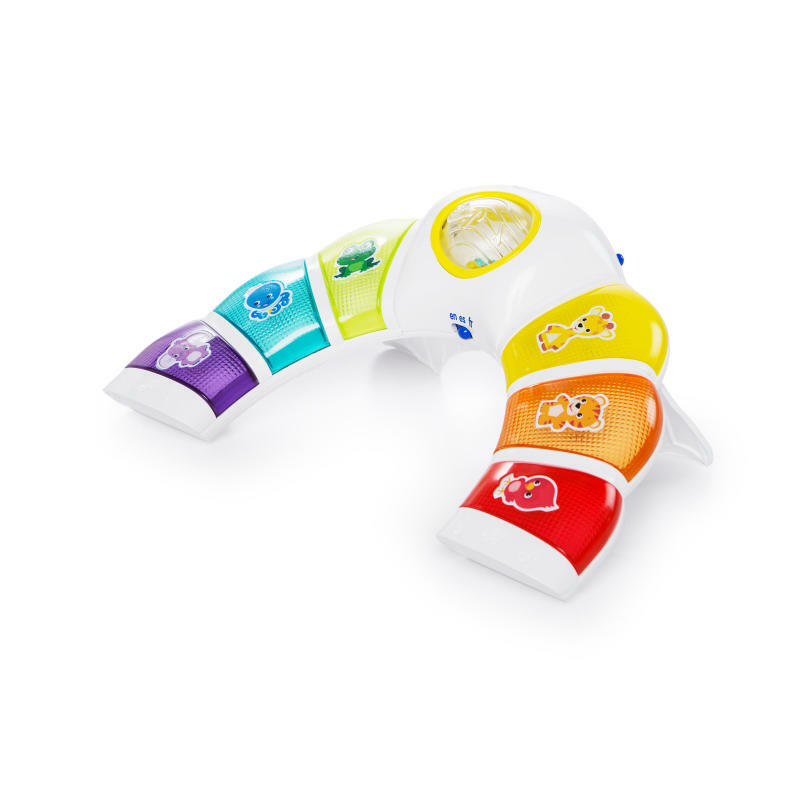 Stimulate baby’s sense of sound with three different modes including animal sounds, colors, and xylophone sounds. Choose from English, Spanish or French, all in available in one toy! Toy bar lays flat for tummy time and props up to elevate the toy during sitting play. When play time is done the toy bar collapses down, perfect for storage and portability. Perfect for babies 3 months and older. This easy to activate toy bar is fun and interactive for little ones! Dimension (in) 5.85" x 12.8" x 9"
Rated 4 out of 5 by samora23 from Great toy! Great toy to use for tummy time! The colors are very stimulating and I love that it has 3 different languages. Rated 5 out of 5 by Asavoie0630 from Love the different languages I bought this for my 11 week old son as he loves anything that lights up and has music. I love the fact that it has 3 different languages as we are a bilingual family and he will be learning Spanish. It’s perfect for him to lay next to on the floor and when he starts to sit up on his own. He instantly starts giggling when I turn it on for him. Rated 5 out of 5 by Asavoie0630 from Love the different languages I bought this for my 11 week old son as he loves anything that lights up and has music. I love the fact that it has 3 different languages as we are a bilingual family and he will be learning Spanish. It's perfect for him to lay next to on the floor and when he starts to sit up on his own. He instantly starts giggling when I turn it on for him. Rated 5 out of 5 by cmac1030 from We love this! We love the Glow and Discover Light Bar! The colors and lights easily keep baby interested and our daughter could use this early on! The best part is how convenient and easily transportable it is whenever we have to travel. Rated 5 out of 5 by Melissa C from A lifesaver for tummy time! Our little one has fought tummy time since day one, and we have worked very hard to try and distract him and avoid epic meltdowns before 30 seconds of tummy time has lapsed. Enter this light bar: Bright lights, music, multiple settings (including Spanish and French! ), and a perfect way to entertain our little one during a time which was previously torture for all of us. Now that he is older and able to sit with support, he loves hitting on the lights and making his own music. We are thrilled with this light bar and only wish we had found it sooner in the process! Rated 4 out of 5 by Sjhbulldog from Great for tummy time This is a great toy to keep baby motivated and distract during tummy time. I like that the height adjusts and it keeps baby's attention. My big 2 year old even appreciates the different options with music, animal names, etc. My only qualm is that I think it is too overstimulating for a young baby. All the flashing lights and sounds seem to be a bit much for the suggested age range on the packaging. I will continue to let my toddler play with it but will limit how much the new baby looks at it. It's hard to go back to open ended wooden toys after looking at something like this! If you like your baby to look at colorful flashy lights with lots of sounds, you'll love this! Rated 5 out of 5 by Cobainian from Super cute you!!!! This is such a fun and educational toy for little ones! I love the way it lights up and catches their attention. I like that there are 2 volume switches so it isn't loud and annoying. It can be used as a tummy time activity before they can sit up, or they can play with it on their lap or on a table as they get a little older. It plays some cute music and helps them learn their colors. We love Baby Einstein in our house and this toy does not disappoint! Rated 4 out of 5 by HannahP from Great for tummy time My child loves this Light Bar for her tummy time! The bright lights and sounds keep her very entertained. It also has 3 languages which is great. I like that it will transition with her when she is able to sit up on her own. I wish the opening was slightly larger so her body could fit better. She always seems to push it away on accident because she doesn't quite fit in the opening.